Note: As with all my posts you may Click on the Image to view it larger in LightBox Mode. I have a good friend, and excellent photographer, who recently said that he thought I preferred black and white image making over color. I was not sure this was true and in fact a review of my various social media feeds showed that I was probably split down the middle on the use of color versus black and white. I think that what he was referring too was that I tend to push certain types of images into black and white while others go to color. I shoot my landscape images predominantly in color, whereas my street, architecture, and even my portrait work strays over into black and white. I do not have a formula for the decision on which way I might process an image, preferring a more iterative approach driven by the type of light I was shooting in and whether the color tones in the shot would convert well to a dramatic or compelling black and white. Additionally, color can often detract from a composition, and that is something I like to consider when thinking about the final rendering of a photograph. On a recent trip to downtown Washington DC, long-exposure photography was on my mind. I had just returned from a trip to St Louis where I dabbled in several long-exposure shots and was determined to try out the techniques in Washington. For the DC trip, I made the effort to pack the big gun - the Fuji GFX 50s along with my NISI Filter kit - to capture some long-exposure shots of the Capitol, the Jefferson Memorial, and whatever we might find. The weather cooperated by providing some nice, high cirrus clouds that were perfect for the long-exposures, but over time they began to fill in with an approaching storm. So we moved on to some lunch and street photography. For our street explorations I brought my Fuji X-H1 and one lens - the Fujinon XF 35mm f 1.4 R. While an older lens in the Fuji lineup it is nonetheless a classic with superb color rendering and micro contrast rendering. Washington DC is full of color, even in the interstitial zones between winter and spring and even despite the gloomy clouds gathering overhead. I thought I would shoot primarily in black and white but it was not long before I began to focus in on some of the subtle colors, and the explosion of color in some instances, and decided to explore instead the world of color. Color of course effects us in many ways. How many of you respond to the beautiful explosions of colors at sunrise, or sunset, the grey tones of a cloudy day or the calming colors of blues and greens. 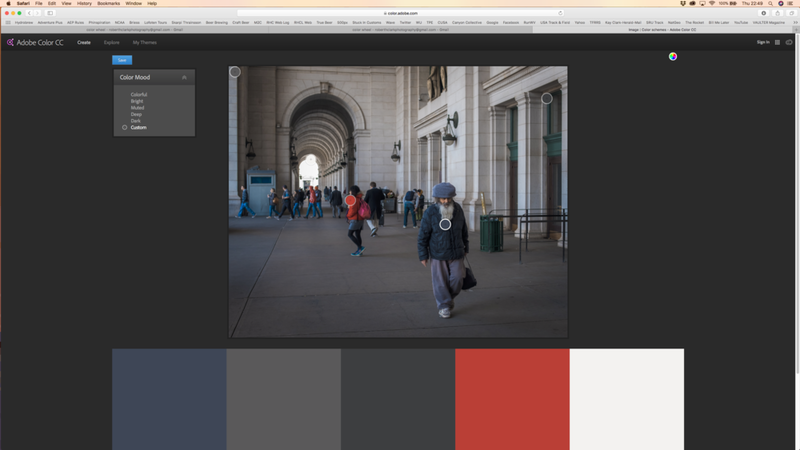 Finding these color palettes, and using them in your images helps to add another layer of depth and contributes to the overall story you are trying to tell. The Color Wheel is one of the the basic tools for thinking about color and combining them into pleasing arrangements. The wheel is designed so that any colors you pick from it will work well together. Additionally, there are a number of pleasing color combinations that we all respond too, referred too as color harmonies, that consist of two or more colors with a fixed relationship in the color wheel. Classic harmonies include blue and orange, or blues and golds, like we might see in a sunrise or sunset, and reds and greens. This is referred to as a Complementary Color Scheme and draws from colors directly opposite to each other on the Color Wheel, (wheel number one, far left below). Other combinations (moving left to right), include Analogous, Triadic, Split-Complementary, Tetradic, and Square. 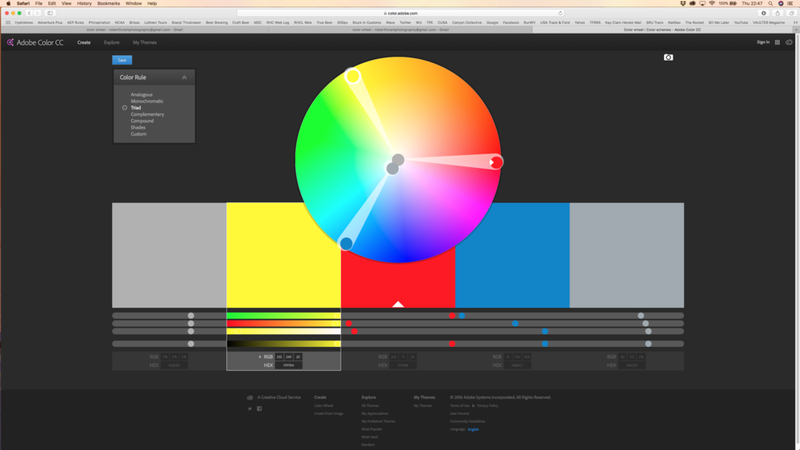 To see, and even create, color wheel combinations you should visit the Adobe Color Wheel site. The link is Here. The Adobe Color CC page is quite interesting and you can look at color variations based on the color wheel. In addition you can see what the major color components of an image by importing it into the program. It is important to understand that the colors you are presented with in your scene are constantly changing with the type of light that is present. What looks harsh and washed out in direct sun will completely change under cloudy conditions, in twilight, with artificial light, or when in shadow. When I am thinking about color in a scene I find it helpful to attempt to isolate the main color component and look for compositions and other colors within the scene that compliment each other. If you consider the color wheel combinations above, imagine that you can spin the black dots around the wheel to find many color relationships that work well together. When you are out shooting it can be helpful to set your liveview screen to one of the Fuji Film Emulations. There are many times that I use the ACROS Emulation when shooting black and white, and for color, my favorite is the Classic Chrome. If you are shooting in jpeg mode your shots will be saved in these emulations, but it will not apply it to the RAW file. You can easily apply it however in Lightroom. I will readily admit that in street shooting I am often more engaged in what is happening in front of me but I also respond to other stimuli, most notably light. Color is another stimuli that I respond too and somehow finds its way into my compositions on a subconscious level. A red jacket, a bright yellow scarf, intense greens and blues in grass and skies are just some of the many colors that I am attracted too. I often think of color as analogous to light. Of course it is NOT light, but it pops, glows, and becomes apparent with light and that is often what I am responding too. My subconscious prevailed in The Guru (first image), where my focus was on the old man but I captured a nice, but subtle, complementary color set between the blue and the orange-reds. The scene itself is quite neutral and it is the inclusion of people and the colors of their clothes that brought it together. This complimentary color set, including the neutrals, was quickly identified when I brought that image into the Adobe Color CC site. For the image Solitary Man (image 2 below), I picked up on the dominant color of the blue-green fountain and composed to include the analogous colors of yellow and green. Keep in mind that I was not particularly thinking about an analogous color palette while composing the image. More in fact it was the interesting pattern of the fountain that sparked my interest, then its color, and finally the pop of yellow in the sculpture. That is when it came together and I simply waited for someone to walk through the scene. In the image A Compassionate Moment (image 3 below), the color palette is Triadic and brings together blues, magenta, and orange. For this I was largely drawn to the magenta color of the saucer magnolia blooms, and it was only when the scene unfolded in front of me, that I was able to capture this very human story of a man with Alzheimers. In The Tourists (image 4 below), the bright yellow scarf really jumped out at me and the final composition included a complementary color pair featuring purple and yellow. The Guru • Union Station, Washington DC. | Fuji X-H1 and a Fujinon XF35 f1.4 | ISO 400, f5.6, 1/250 of a second. Solitary Man • Hirshhorn Museum, Washington DC. | Fuji X-H1 and a Fujinon XF35 f1.4 | ISO 400, f5.6, 1/200 of a second. A Compassionate Moment • Smithsonian Museum, Washington DC. | Fuji X-H1 and a Fujinon XF35 f1.4 | ISO 400, f5.6, 1/250 of a second. 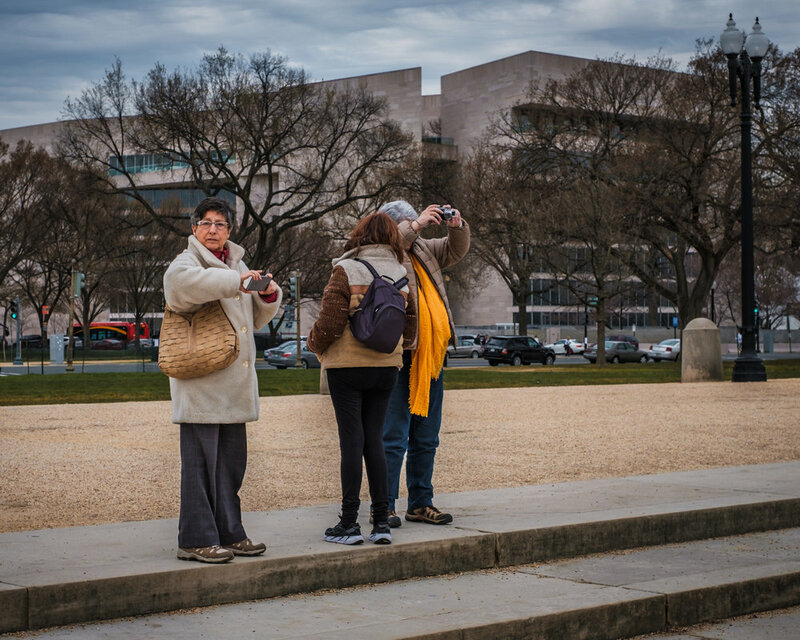 The Tourists • National Mall, Washington DC. | Fuji X-H1 and a Fujinon XF35 f1.4 | ISO 400, f5.6, 1/250 of a second. By this point in the day I was not even thinking about black and white. Color was going to rule the day. As we moved into Chinatown the colors became more and more complicated, in some instances consisting of subtle color combinations, to an outright cacophony of color, where all of them seemingly competed for attention. The color tones in Watching and Waiting (image 5 below), are some of my favorites and I would consider this one a Tetradic scheme, where cool blues and purples are working together with the warm reds and golds. But like the other images I was drawn first to the human part of the scene when low and behold a red car and red motorcycle became the color pop, along with complimentary gold tones. As you look at the next group of images, The Intersection, The Big Hat, and The Chintown Gate, you will see the color palette intensify and grow. Color becomes the main draw to the scenes and in some way almost overpowers the compositions. But looking further into the images you begin to see color as the stage set and start to find some of the stories. Watching and Waiting • Chinatown, Washington DC. | Fuji X-H1 and a Fujinon XF35 f1.4 | ISO 400, f5.6, 1/125 of a second. The Intersection • Chinatown, Washington DC. | Fuji X-H1 and a Fujinon XF35 f1.4 | ISO 400, f5.6, 1/250 of a second. The Big Hat • Chinatown, Washington DC. | Fuji X-H1 and a Fujinon XF35 f1.4 | ISO 400, f5.6, 1/250 of a second. The Chinatown Gate • Chinatown, Washington DC. | Fuji X-H1 and a Fujinon XF35 f1.4 | ISO 400, f5.6, 1/400 of a second. The last two images are a couple of my favorite shots from this trip. When I captured Ocher I was standing outside of a coffee shop studying the funky ocher-colored light sculptures when a guy crosses the street wearing the same color jacket as the sculptures. My initial quick "photographer" thoughts were, was cool looking guy, great beard, lots of character . . . and, "what the heck", look at the color of his jacket. Click! It was absolute serendipity. And finally in The Phone Call there was quite a bit going on against the backdrop of the intense blue walls. 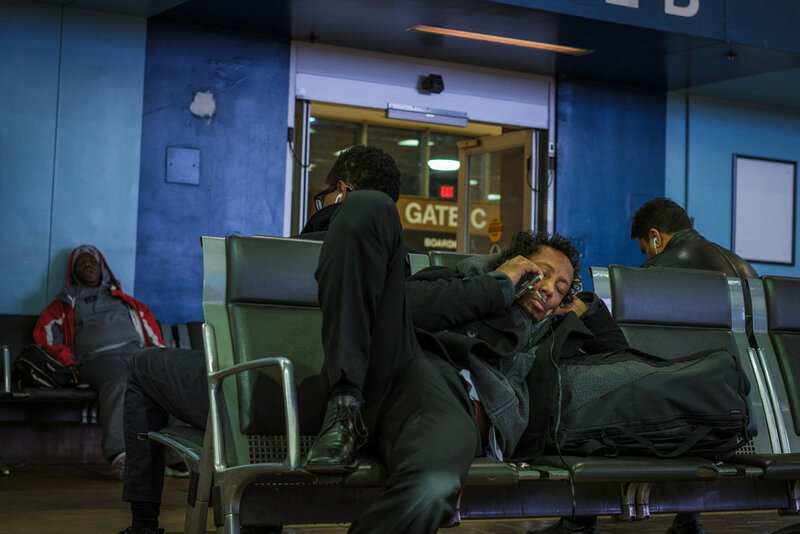 The story of course is the guy on the phone, who actually fell asleep while talking to someone. But do you see the complimentary colors in the image? Ocher • Uptown, Washington DC. | Fuji X-H1 and a Fujinon XF35 f1.4 | ISO 400, f5.6, 1/250 of a second. The Phone Call • Union Station, Washington DC. | Fuji X-H1 and a Fujinon XF35 f1.4 | ISO 800, f4, 1/100 of a second. The are many ways during image processing to manipulate color. My primary choice is the HSL Panel and Selective Color. All of the images were processed, from the Fuji RAW, RAF files, in Lightroom Classic. For some of the images I made the conversion to the Classic Chrome Film Emulation, and the others were left in Adobe Standard. You have many options for tweaking color and I readily use the HSL Panel in Lightroom to manipulate the Hue, Saturation and Luminence of colors in the images. I primarily manipulate the Luminence color values which can pop a color or even recover some of its tonality. I never apply the Saturation Slider however, as this is like using a sledge hammer to drive a tack. I do not believe that color can be improved by over saturating it with a slider. For the most part I will up the vibrance of color while decreasing the saturation a few points. Essentially after identifying the main color components of my image I am looking to manipulate those combinations by popping the luminence values and overall color vibrance. After other adjustments for development and sharpening the files are moved into Photoshop where there are some further refinements including final color tweaks using Selective Color, and dodging and burning. I am always looking to make the colors "intense" but not necessarily garish or over the top. Intensity and pop but with reality in mind.